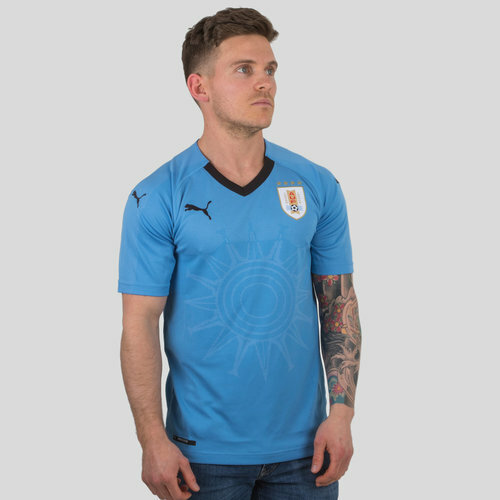 Made for proud Uruguayan supporters, worn by fans and players ready for the upcoming big games in the 2018 Russian World Cup, the Uruguay 17/18 Home S/S Replica Football Shirt comes in Silver Lake Blue and Puma White. As a replica of the jersey which will be worn by the players in the 2018 Russia World Cup, you can expect a look and feel which is slightly less fitting than the pro shirt. 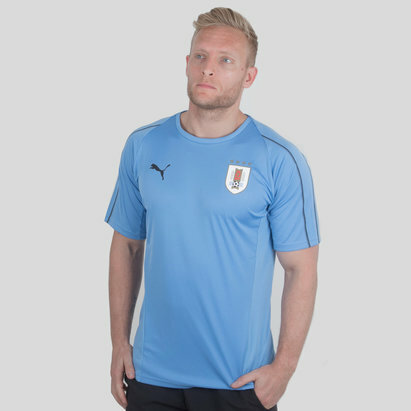 The traditional blue and white known around the world as the colours of the Uruguay footie team again features on this shirt, the classic look takes a modern twist with the slight sublimation on the chest. A black collar contrasts with the blue for an added touch of class. This shirt simply offers a slightly more relaxed fit and slightly less tech than the pro, however, this shirt still utilises Puma dryCELL fabric wicks sweat away from the skin helping to keep the wearer dry and cool during the heat of the action. Model's height: 170 cm/ 5'6"